No one wants to see their beautiful brick turn into a dirty wall. I wouldn’t want to spend my money and effort on a new brick floor only to see it get dirty, moldy and yucky over time. Brick is a very beautiful building material that needs to be cleaned just like everything else. The issue with brick is that a lot of people don’t know how to properly clean it. To keep the brick from getting excessively dirty over time, we recommend a light monthly cleaning. This is to remove any dust or dirt that might have accumulated on it. Regular dusting will help preserve the color and texture of the brick. Simply wipe off the dust using a dry cloth or feather duster. Next, take a brush or broom and lightly scrub the brick to get the harder dirt and grime off if needed. 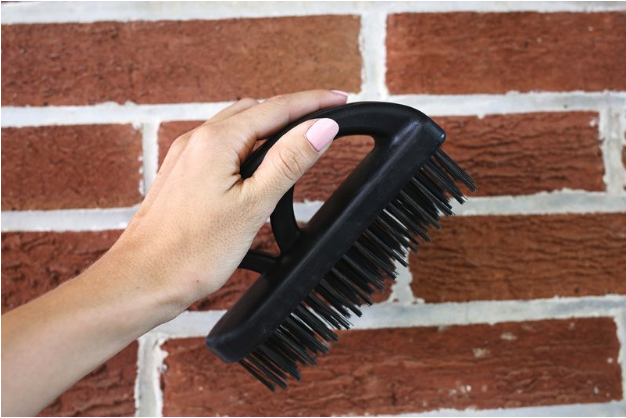 Use a coarse bristle brush to first wet the brick before applying your cleaner. Because brick is very porous, you want it to be saturated with water so that it doesn’t soak up the cleaner deep into the brick. If you are using a powdered cleaner, mix it with a small amount of water to get a toothpaste texture so the cleaner is very concentrated. Then use your brush to scrub it onto the brick just like brushing your teeth. When the brick and grout is all covered in suds, wet your brush and go back over the brick with a generous amount of water. Repeat this as needed to get all of the cleaner off of your brick. Any cleaning solution left on the brick can stain or discolor it. Note: Before cleaning all of your brick, start by cleaning a small section of a few bricks as a tester. After waiting a couple hours, come back and if the brick has not been harmed or discolored, it is safe to use the product on the rest of your brick. This is a secure way of knowing for sure your brick will be good as new after the cleaning process. You can use the same oxygen bleach powder outside as you do inside. Oxygen bleach is great because it is non toxic and won’t kill your plants or harm any pets. Start by scrubbing your brick with a brush and water in order to break up any mud, dust, or dirt on the brick and saturate the brick with water. Then, mix up your cleaning solution and scrub it onto the brick. Let the cleaning solution sit for a few minutes before hosing it off with a small amount of pressure such a thumb pressed in the stream of your hose or a common sprayer attachment. Note: Again, clean a small section first to test the results. We do not recommend using a pressure washer. While the results may look impressive and mesmerizing, the results can be eroding the grout out from between your bricks and even eroding the bricks themselves. An old fashioned hose, street sweeper brush, and non toxic cleaning solution is just as effective and less harmful to your brick. If you have any other questions about how to clean your brick feel free to call us at 1-888-264-6455, email us at hello@oldmillbrick.com, or use our chat option on our website at oldmillbrick.com. You can also go to gobrick.com for detailed cleaning information.